We're currently working on the dockable property window. If we finish in time, it will be in the next release. Export: OBJ is supported in version 1.5. Alembic will come later. Auto conversion of nodes: we've done a prototype to automatically insert some conversion nodes. We now need to implement the feature properly. A big feature we're currently working on is the possibility to work with large color maps (unlimited color map size compared to the 2K x 2K maximum size we currently have), because we had a lot of requests for this feature. Our goal is for you to get the same performance when working on color maps or on terrains with color maps than the performance you already have on terrains alone. Also, one more request: Dockable Property window. Wysilab provides you with some useful, ready-to-use components to use directly in your projects. Download our component packages and get started. Use our TransferDetails, SplitView, DisplayHelper, and Utility components packages in your project, set your own parameters, export them to use in other projects, and even share them between teams! 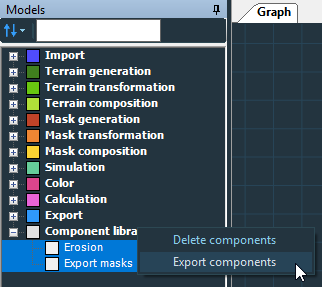 The TransferDetails library contains four similar components that work on both terrains & masks. 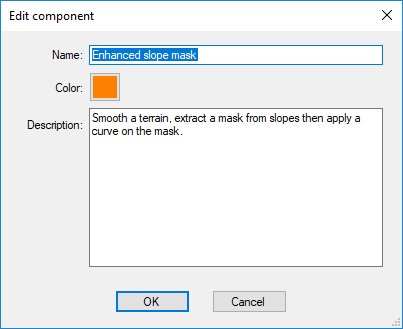 Use these components to transfer details from a terrain or a mask to another one and use a mask to limit the effect to areas of the input. Set the details size to extract and whether to add or subtract them in the target terrain. The Splitview library contains one component. 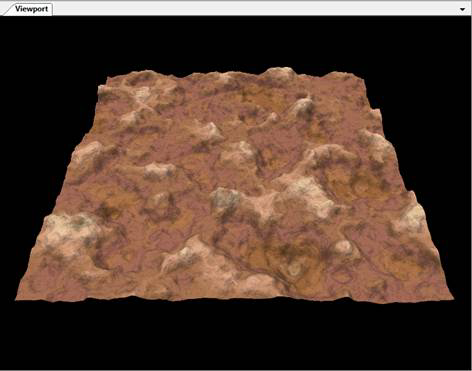 Use it to compare two terrains using a virtual line that reveals or hides either of the two inputs. It embeds a utility component called SplitMask that generates a black and white mask on either side of a line. The DisplayHelper library contains two components used to convert a mask into a colormap and display masks directly in a terrain to better visualize slopes, curvatures, and flowmaps. The Utility library provides some basic, useful components. Can you run Dxdiag on your computer, click on "Save all information" and send the generated .txt file to support@wysilab.com? Also it would be nice if you could open the system information panel on Windows (use the Start menu and type "system information"), click on File > Export and again send the generated .txt file to support@wysilab.com. If you don't know how to do it, please send an email to support@wysilab.com, and we'll be glad to help you. Definitely. This is in our roadmap. You can do it easily with a 'Constant elevation' terrain node and an 'Export mesh' node (see screenshot). OK. We need to check what we can do. That's a good idea. We'll add it to our backlog. It would be nice if the terrain export node has a few features that seem to be missing at present. 1: Export to OBJ and Alembic. 3: Bridge for various apps? example: If the user wants to plug in a color ramp to the color output node, IT can just auto insert a color ramp to color map node in between. Similar feature conversion for other input types. We have just released Instant Terra v1.4 with the components feature that let's you create components from your graph nodes, and create component libraries to organise and share your components between projects. 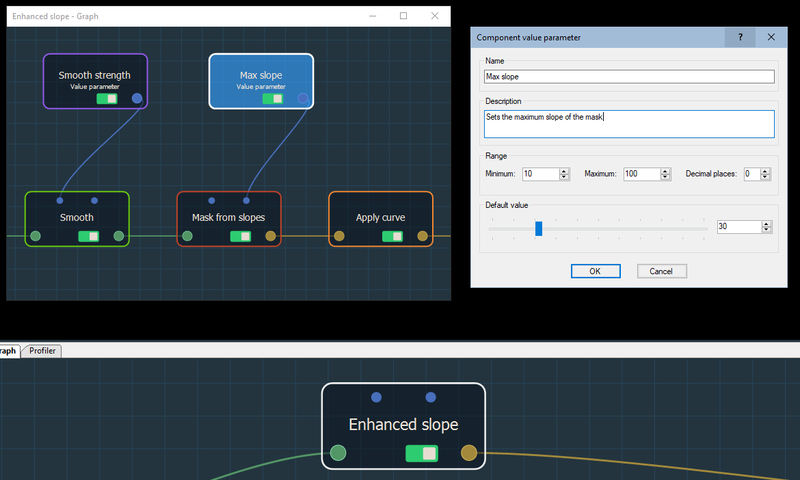 Create components from nodes in the graph, each with their own parameters. Use them again in your project or export them and use them in other projects. Create new component inputs and outputs, including terrain, mask, value, color map, and vector map. 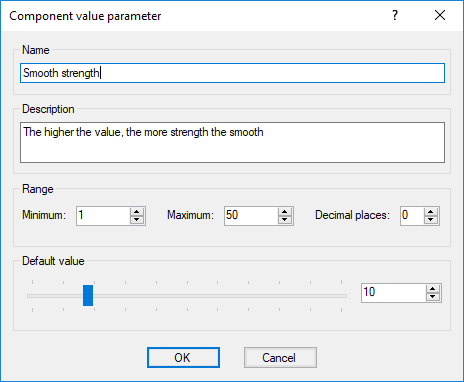 Drive parameters within a component by linking value parameters to the node's optimal connectors. Create component libraries to use in your project. 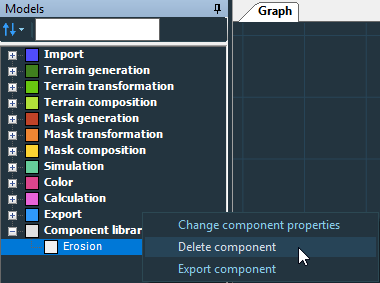 Export your components as .terralib files and import them into your other projects. Use the Global libraries to automatically share your components among all your projects. 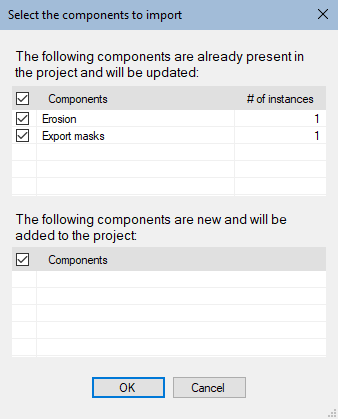 We have finalized the components feature in Instant Terra v1.3.5. Components provide a powerful way to create new nodes to use in the graph to be re-used and shared among projects. They are composed of component instance nodes, or component nodes, each with their own parameters. Create a component from selected instance nodes and add a name, a color, and description to distinguish it. The selected nodes are replaced by a single component node that can be re-used in the project and exported. View the nodes in a component graph by selecting Edit component in the Edit menu. Two nodes are added automatically to the graph: a node input connector and a node output connector. 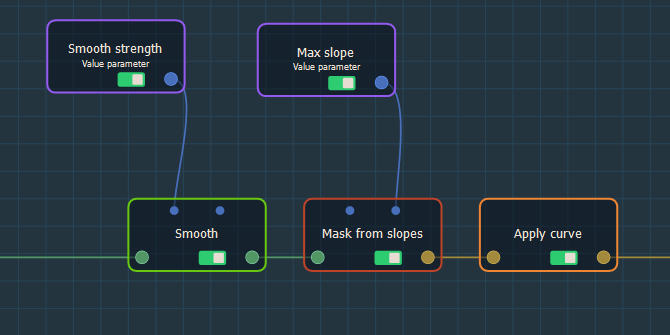 When you select a node in the component node graph, its corresponding terrain or mask appears in the 3D View. As such, you can see what is happening inside a component node. Create parameter values and link them to a component instance node via the optional connectors. Export and import components as .terralib files. If the components are already in the current project, the import updates the components so that they exactly match those in the .terralib file that is imported. These .terralib files can then be copied to a folder of your choice or added to the project as global components. Easily delete components from the Models window.